The Inertia’s inaugural EVOLVE Summit was a dream come true with the surf and snow worlds coming together to discuss environmental and sociocultural challenges and solutions within the riding community so we can all #STOKEresponsibly. If you missed the tearjerker from Sal Masekela about Tom Carroll boycotting the ASP Gunston 500 in South Africa in 1985 due to Apartheid, or the inspiring keynote closer from Hawaiian Congresswoman and surfer Tulsi Gabbard, or any of the other amazing panels and films, then watch the full webcast replay including STOKE Co-Founder, Dr. Jess Ponting, with Chad Nelsen from Surfrider and Elena Hight from Protect Our Winters on the ‘Mountains to Sea: Protecting Earth’s Sacred Places’ panel (pictured above with Andrew Hamra‘s stone sculptures for the silent auction benefitting both of these nonprofits on stage). Congrats to everyone at The Inertia, Playa Studios, and 8081 Productions for delivering such an incredible and empowering event without sacrificing sustainability! 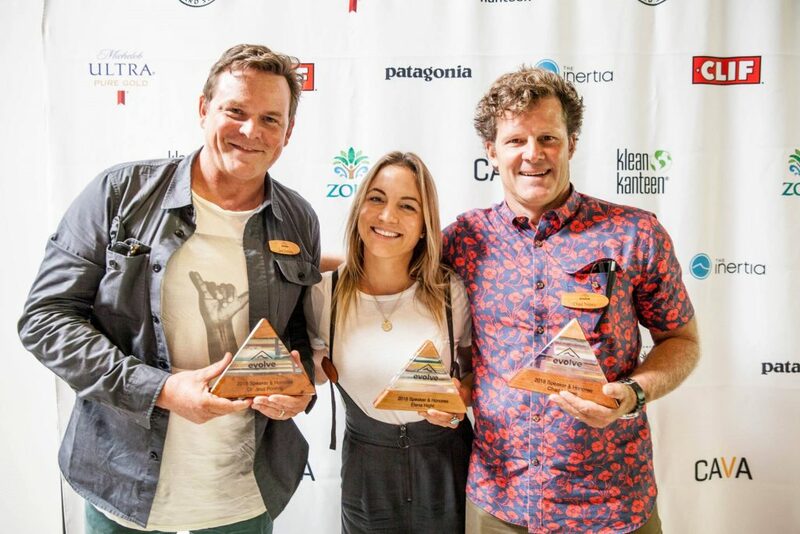 We’re honored to have The Inertia join the STOKE tribe with a STOKE Benchmark and Roadmap to Certification Report this year and we look forward to making EVOLVE the most sustainable gathering possible as a STOKE Certified Event in 2019. Many thanks to our friends at Reeco Surfboards for providing the upcycled surfboard auction, surf resin plaques and wax combs; Ethan Estess for the upcycled fishing rope art auction and signs; FloWater and Klean Kanteen for the plastic-free hydration; Clif Bar for the TerraCycle wrappers recycling bin; and Michelob Ultra for sponsoring the waste management program. Check our Instagram Story Highlights (STOKE Events) for more #sustainablestoke from the event!